Premium Power. Our premium NASCAR Select is the best in the business. It is maintenance-free and engineered to deliver maximum performance under the toughest highway or off-road conditions. So whether you drive an SUV over wild terrain or a passenger car on punishing highways, expect optimum performance from your Exide premium battery. · HEAVY CAST ON STRAP: For a more rugged, durable design. Improved connections between plates and straps. Less cracking under stress. Longer battery life. · STABL-LOK™ INSULATION: Between plates and the negative strap helps battery cope with high under hood temperatures. · STABL-LOK™ BOTTOM-ANCHORED PLATES: Protects battery from vibration damage. · PROPERZI ROLLED STRIP PROCESS: A European production break through eliminates problems with many cast and or expanded grids. 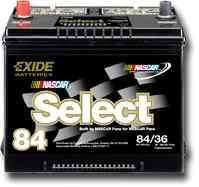 This allows Exide to manufacture a battery with greater durability and longer service life. · INCREASED LUG HEIGHT: Provides greater separation between straps and plates. Reduces shorts. Prolongs battery life. · HEAVY DUTY GRIDS VERSUS ORDINARY CAR BATTERIES: Lasts longer. More ruggedly constructed. Enhanced durability under today’s harsh operating conditions.